including one which was only recently reported from the country, Siler. 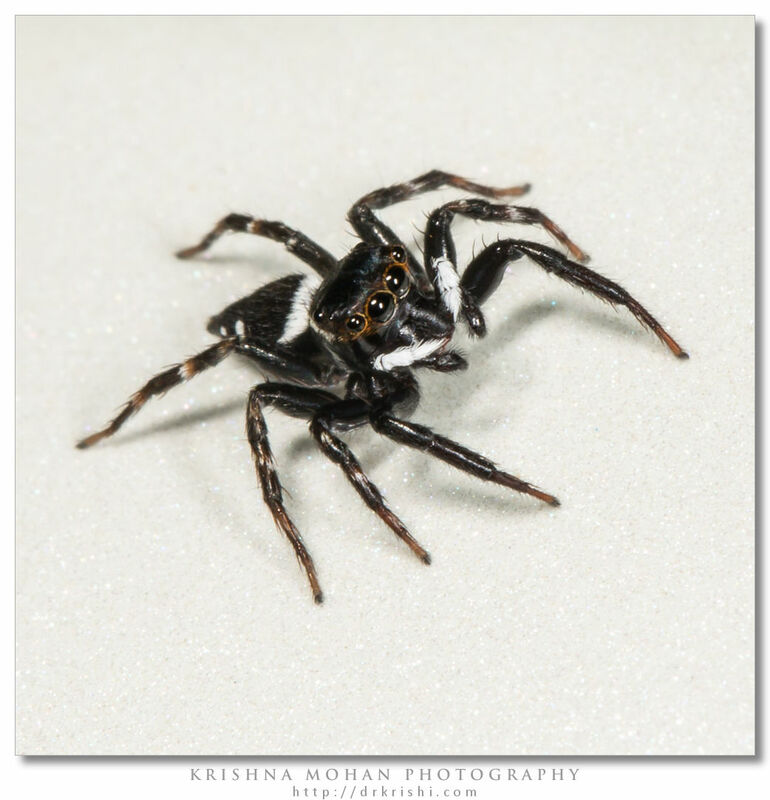 Adanson’s Jumping Spider was photographed using a Canon EOS 5D Mark III with Canon EF 100mm f/2.8L Macro IS USM lens and illuminated by a Canon MT-24EX macro twin light flash. A sexually dimorphic species, males are easily distinguished by their darker coloration and sharply contrasting, crescent shaped white markings. An active hunter, It is also known to occasionally inhabit specially constructed silken cells, placed amongst low vegetation, presumably during periods of rest or ecdysis. 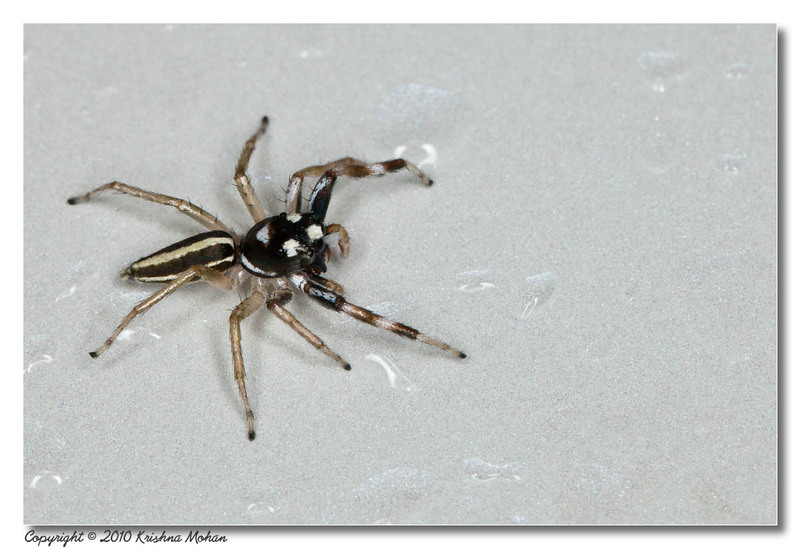 While it may not be as gaudily colored as a few other Salticids, it’s certainly an elegant species, decked in shades of black, white and brown. For the vast majority of humans, blurry vision usually means spending a fair bit of money on a pair of prescription lenses. For an Adanson’s house jumper, however, it’s a means of procuring meal. 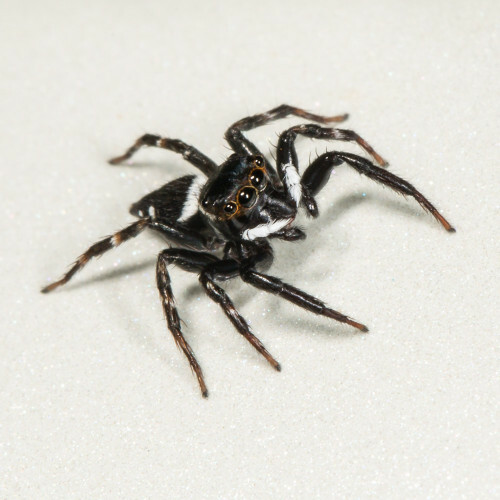 Hasarius adansoni hunts by swiftly leaping on unsuspecting prey, often from several centimeters away, grabbing on to and dispatching victims with a venomous bite. 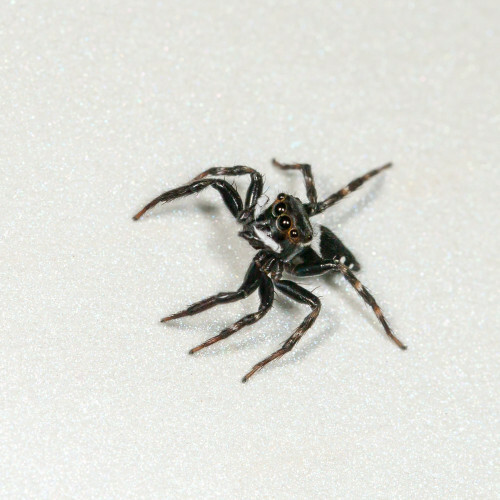 To pull off these marvelous leaps, however, the distance between the spider and it’s prey has to be accurately gauged, for which, paradoxically, part of the spiders visual field is permanently out of focus making it the only known species in the animal kingdom to judge distance in this manner. To cope with its agile lifestyle, the species possesses top-class color vision, but that doesn’t help in judging distance. Human eyes judge distance by comparing visuals from two overlapping fields of vision. 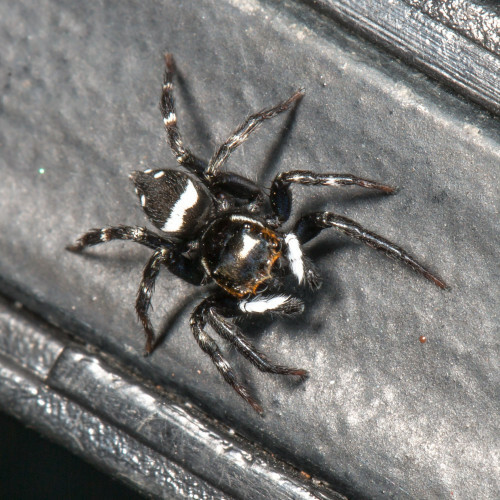 An Adanson’s house jumper, however, does so in a very unusual manner. 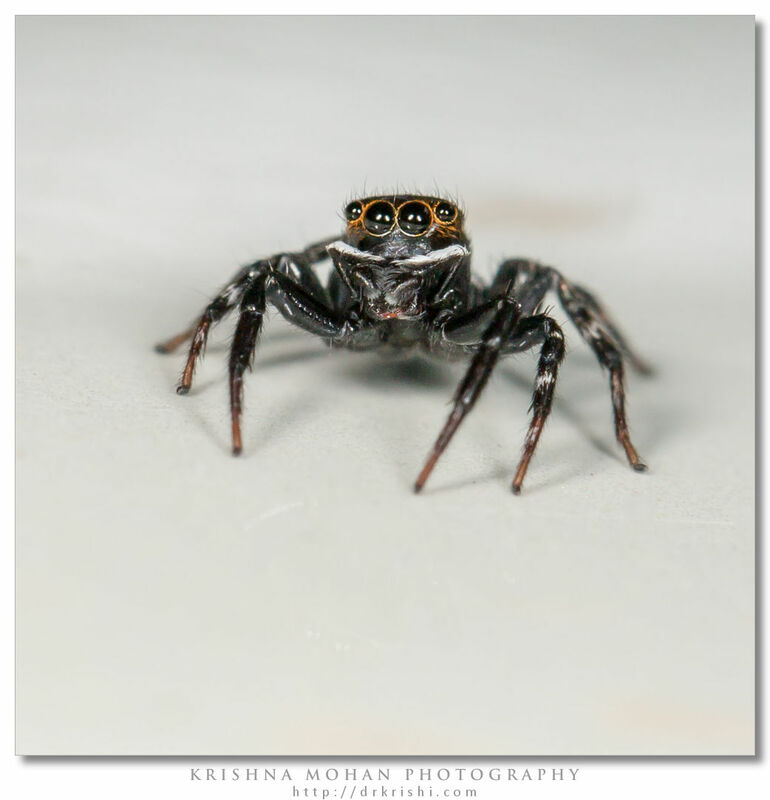 The spider has two pairs of forward-facing eyes, the central principal eyes or the anterior median eyes, as they’re better know as, which are flanked by anterior lateral eyes. 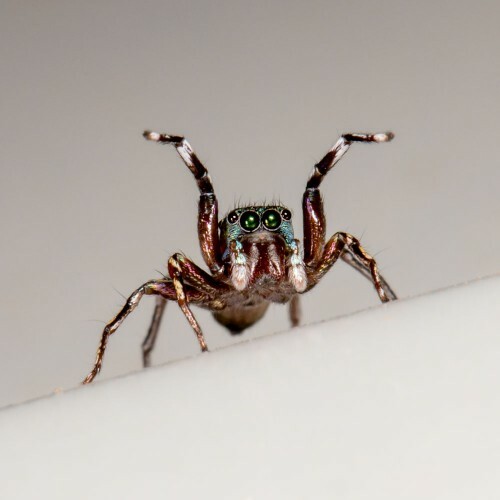 If the latter pair are blinkered, the spider can still judge distance, thus implying that it is the principal eyes alone which are capable of judging distance. 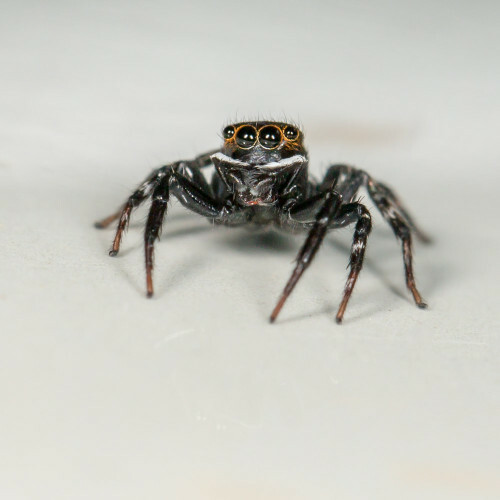 Also, unlike human eyes, the visual fields of these eyes do not overlap and are thus incapable of adjusting their focus, meaning that the spider can not possibly use any other means for judging distance. 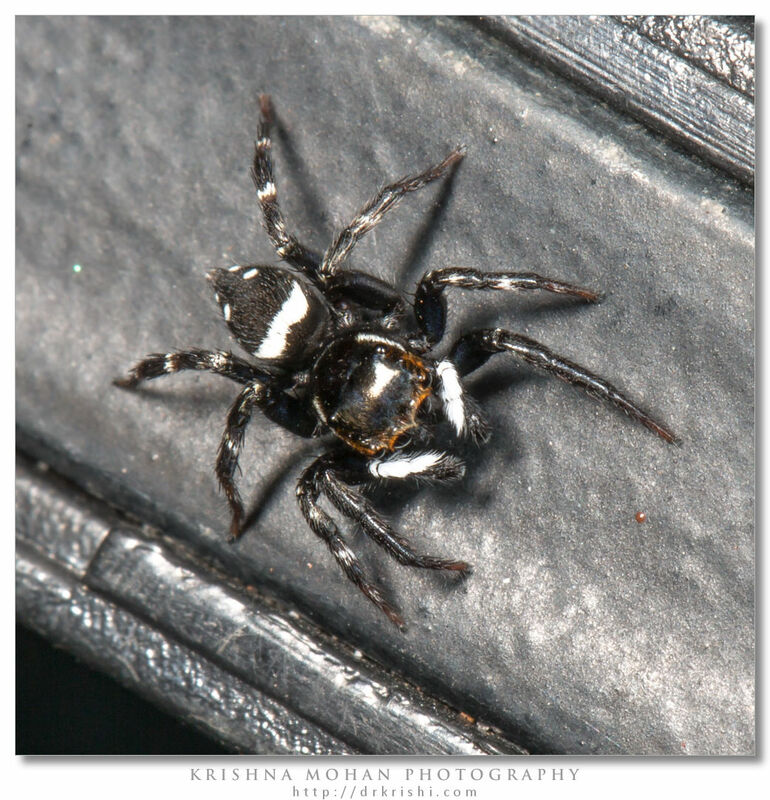 Most interesting of all, perhaps is the fact that the species possesses four layers of light-sensitive cells in its retinas, the second-deepest layer of which is full of receptors sensitive to green light, which, surprisingly, is always out of focus, resulting in an image that is mostly blurred, contrasting with the sharply focused image on the layer below. 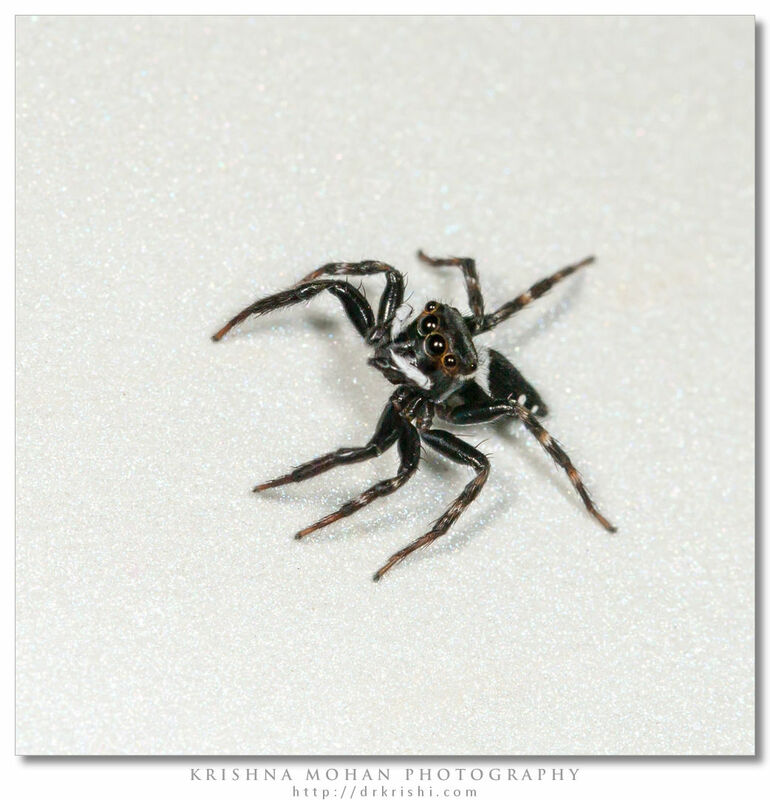 As the spider closes in on its prey, the defocused image gets blurred further, thus helping the spider gauge distance. We Humans do something similar with our eyes, when we look at photographs in which the subject is sharply focused against a blurred background. That however, only tells us that the subject and background are at different distances. It doesn’t tell us how far we are from the subject. There exist microscopes capable of determining depth in this manner and engineers working on computer vision have long been interested in the idea. Nagata, T., Koyanagi, M., Tsukamoto, H., Saeki, S., Isono, K., Shichida, Y., Tokunaga, F., Kinoshita, M., Arikawa, K., Terakita, A., 2012. 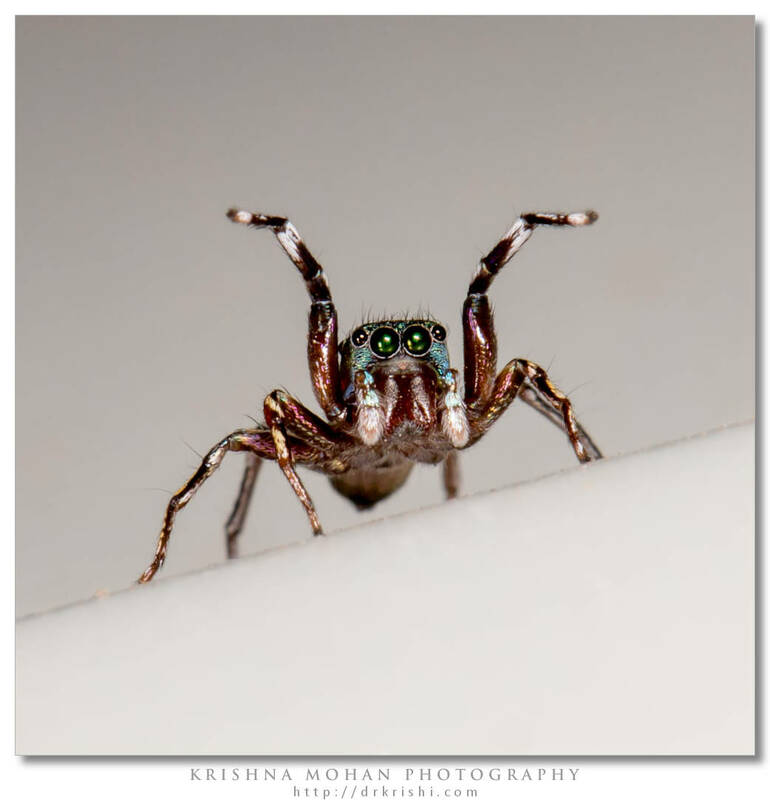 Depth perception from image defocus in a jumping spider. Science 335, 469–71. Thanks to Javed Ahmed for helping me to write this blog. EXIF info - Aperture : ƒ/10 | Camera : Canon EOS 5D Mark III | Taken : 15 July, 2012 | Flash fired : yes | Focal length : 100mm | ISO : 100 | Location : 13° 4.0311′ 0″ N 74° 59.7279′ 0″ E | Shutter speed : 1/160s | Images and content Copyright © Krishna Mohan. Please contact me to purchase prints or for image publication license. EXIF info - Aperture : ƒ/14 | Camera : Canon EOS 5D Mark II | Taken : 14 June, 2010 | Flash fired : yes | Focal length : 100mm | ISO : 200 | Location : 13° 4′ 2.1788399970218″ N 74° 59′ 44.315879828326″ E | Shutter speed : 1/125s | Images and content Copyright © Krishna Mohan. Please contact me to purchase prints or for image publication license. EXIF info - Aperture : ƒ/16 | Camera : Canon EOS 5D Mark III | Taken : 10 June, 2012 | Flash fired : yes | Focal length : 100mm | ISO : 100 | Location : 13° 4.0302′ 0″ N 74° 59.719′ 0″ E | Shutter speed : 1/160s | Images and content Copyright © Krishna Mohan. Please contact me to purchase prints or for image publication license. EXIF info - Aperture : ƒ/16 | Camera : Canon EOS 5D Mark III | Taken : 15 July, 2012 | Flash fired : yes | Focal length : 100mm | ISO : 100 | Location : 13° 4.0311′ 0″ N 74° 59.7279′ 0″ E | Shutter speed : 1/125s | Images and content Copyright © Krishna Mohan. Please contact me to purchase prints or for image publication license. EXIF info - Aperture : ƒ/18 | Camera : Canon EOS 5D Mark III | Taken : 15 July, 2012 | Flash fired : yes | Focal length : 100mm | ISO : 100 | Location : 13° 4.0311′ 0″ N 74° 59.7279′ 0″ E | Shutter speed : 1/125s | Images and content Copyright © Krishna Mohan. Please contact me to purchase prints or for image publication license. I caught one reaching a length of 1.3 cm is that even possible?